A card with several services in and around the Villnöss valley in the Dolomites. 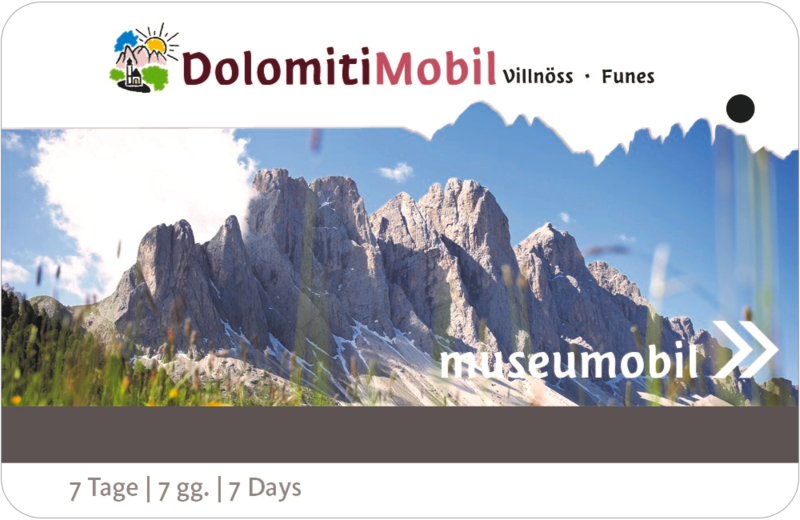 The new DolomitiMobil Card, that we put at disposal of our guests for free, combines the free use of all public means of transport with the free entry in over 80 participating museums in the whole South Tyrol. In summer you can take part to guided excursions and alpine tours, visit the swimming pools Aquarena in Brixen, in Klausen und Feldthurns, or use the trip busses and the Seceda funicular for free. In winter the card offers you the free use of the”Filler” skilift in Villnöss (1 x week) and of the “Maders” skilift in Schnauders/Feldthurns, guided snowshoe hikes, the Plose skibus and the ” Skisafari” winter bus. Moreover there are also different occasions for wine tasting in the participating wine cellars of the Eisack valley.